Today we review a set with featuring figures with completely incorrect names. Make Halloween last forever?! That's just evil! Not that Halloween isn't a ton of fun, but if it goes on forever we'll never get to celebrate that best of holidays, Discount Candy Day. It's the only holiday that comes three times a year: February 15, November 1 and December 26. On the other hand, if Halloween did last forever, we wouldn't have to have our Horror Month reviews spill over into November, as they're sure to do in the next few days. We've talked before about the origins of Samhain, and we're even willing to overlook the fact that the cartoon pronounces it "sam hane" instead of the proper way - it was the '80s, and doing comprehensive research for a kids' cartoon was unheard of. That's fine. But why did Art Asylum name this figure "Sam Haim," with an M? Is it a typo made somewhere along the line that just kept gettimg repeated amd was never questiomed by the proofreaders? Or is it something CPT Holdings (the licensor) insisted on? For that matter, why is it even two words? 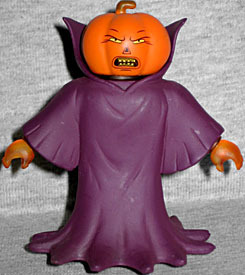 Samhain has a pumpkin head, and is wearing long purple robes that flare out at the bottom - they flare out so much, in fact, that the packaging blister had to be redesigned to accommodate them. This isn't the only set in this series that had a reshaped blister, so I can't imagine how these fit into a case. The robe has a high collar that raises up behind the head, and a minimum of sculptural detailing on the body. 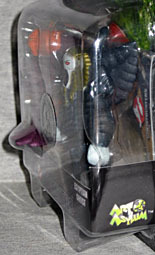 It's molded in purple, for some reason, when the cartoon showed him dressed in brown - maybe they thought that wouldn't be "cartoony" enough to fit with the Real Ghostbusters style on the toys? 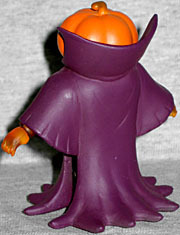 Beneath the robes, Sam Raimi has a translucent orange body. Since the pumpkin head is just a mask, it can be pulled off to leave you with a plain cylinder beneath. The figure has clawed hands, and the "ribcage" paint mask used on Holocaust has been used here, as well. That's a bit odd, actually: we don't get to see beneath his robes on the show, so why do it here - particularly since most people won't be removing the robe anyway? Detective Philip Spade, now the Egyptian Ghost, is still trying to solve the case of the stolen Treasure of King Tod. He teams up with The Ghostbusters to trap the thief, Blacky, and retrieve the Egyptian artifact. That bio is either wrong or it's just phrased incredibly poorly. All the names are there, but they seem to line up wrong; let's take it one by one. Detective Philip Spade is indeed a ghost, and he's trying to track down the stolen treasure of King Tod (there's no way "King Tut" is a protected name, so the writers must have just been playing cute). And yes, Blacky is the thief who stole the treasure. In fact, when he stole it, it transformed him into the Egyptian Ghost. That's him you see in this set. The way the bio is written, it makes it sound like Spade is the Egyptian Ghost, which is just not right. The only thing that's particularly "Egyptian" about this ghost is the head. He has a "screaming" face with a black mouth and red eyes, and is wearing a nemes headdress. It's entirely gold, with stripes sculpted in, and he has an osird (that's the little fake beard you always see on pharaohs). The rest of him is about as Egyptian as your Aunt Hilda. 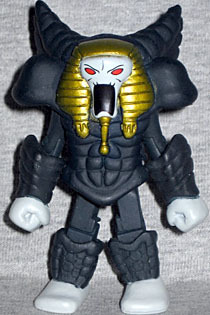 The Egyptian Ghost is a very large specter, so the standard Minimate body has been embellished with new arms and hands, new shins and feet, and a giant torso cap that comprises waist, abs and shoulders. The hands and feet are smooth gray bits, while the shins and forearms are the same grey as the rest of the body and feature sculpted ridges. On his back is a large, two-pointed ridge structure that rises up above the ghost's head and looks like wings or a cobra's hood. What is it meant to be? You'd have to ask the original cartoon designer, because it was right there. 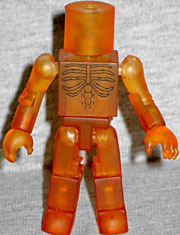 In fact, the cartoon design also had very spindly elbows and knees, so the jump in size between the Minimate limbs and the add-on pieces works out very well. The character should still be several times larger than a human, though. If you can pry that giant chest cap off the figure without losing any pieces inside, there's one more surprise waiting for you: the masked face of Blacky, from back when he was still human. Considering how large both figures in this set are it's understandable that they didn't include alternate "human" hands and feet for him, but it would have been nice. I bought this set solely for Samhain - or Sam Haim, as Art Asylum insists he be called - because a pumpkin-headed guy is always cool. And it turns out he's okay, but not really special. The Egyptian Ghost was just sort of a bonus in the pack, and I was glad I didn't have to buy something lame in order to get Mr. Pumpkinhead (I'm looking at you, translucent blue Terror Dog). The Egyptian Ghost turned out to be pretty darn cool on his own, so this set turned out to be a winner, as far as some small, affordable Halloween figures go.